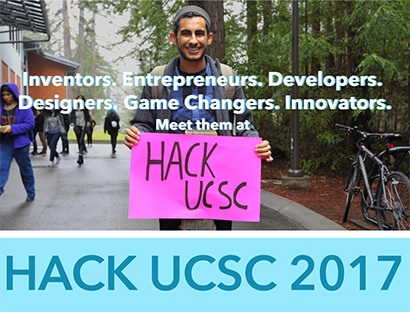 Since its founding in 2013, Hack UCSC has grown into one of the largest hackathons in California. UC Santa Cruz will host its fourth annual hackathon, Hack UCSC 2017, from January 20 to 22 at Porter College. Participation is free, and more than 1,000 students have already applied, so organizers are expecting this year's event to be the biggest yet. Hack UCSC is a non-profit, student-run annual hackathon event aimed at college and high school students interested in technology development. Teams can be formed in advance or at the event, where they will work to create apps and programs that provide innovative solutions to a range of social and business issues. The event provides opportunities to connect with tech industry luminaries, learn new skills, and win prizes in a variety of categories. Hack UCSC 2017 kicks off on Friday, January 20, at 9 p.m. with talks by UCSC alumnus and entrepreneur Tomer Kagan and pioneering computer scientist Ken Thompson. Thompson, the keynote speaker, is best known as co-inventor of the UNIX operating system, and he also invented the precursor to the C programming language. Kagan is the cofounder of search service Quixey and of the resume platform Sigma, a major sponsor of the hackathon. Participants will be competing for prizes in two main categories: Innovation (judged on novelty, technical merit, commercial practicality, and design) and Tech Cares (judged on how the solution solves social and environmental issues, commercial practicality, and design). In addition, sponsored prizes will be awarded in a variety of categories, including best mobile app (sponsored by Pyze), best project by a UCSC graduate student (sponsored by the UCSC Division of Graduate Studies), best use of the Sigma platform (sponsored by Sigma), best use of the Microsoft API (sponsored by Microsoft), best use of the App Engine API (sponsored by Google), and more. At the closing ceremony on Sunday, January 22, the speakers will be UCSC Chancellor George Blumenthal and Bud Colligan, co-chair of the Monterey Bay Economic Partnership and founder and CEO of South Swell Ventures. The sponsors of this event include Sigma, South Swell Ventures, UC Santa Cruz Center for Innovation and Entrepreneurial Development (CIED), UC Santa Cruz Baskin School of Engineering (BSOE), Santa Cruz Economic Development, Santa Cruz New Tech Meetup, QualComm, Microsoft, Google, ProductOps, UC Santa Cruz Arts Division, GitHub, UC Santa Cruz Center for Information Technology in the Interest of Society (CITRIS), Looker, the UC Santa Cruz Student Union Assembly (SUA), Green Visor Capital, Brereton Law Office, Santa Cruz Works, the Community Foundation of Santa Cruz County, Santa Cruz Tech Beat, Red Bull, Soylent, Pacific Cookie Company, Pyze, The Sandwich Spot, and Chipotle.